Hootsuite is a leading social media management service. This service enables you to manage various social media profiles from one place. You can create targeted streams for relevant conversations and engage as you like. The most popular feature of Hootsuite is its automated social media publishing. The powerful analytics and detailed reports will help you to track the performance of your campaigns. By using the apps, you can easily integrate Hootsuite with more than a hundred third-party services. The service could be controlled from its iOS and Android app too. Now, let’s take a look at the pros and cons of Hootsuite. Free: $0 for month. Up to 3 social profiles, basic analytics, 1 team member, basic app integrations. Pro: $8.99 per month. 50 social profiles, 1 analytic report, 1 team member, basic app integrations, unlimited RSS feed, account security. Enterprise: Available on request. 100+ social profiles, unlimited analytic reports, 500,000 team members, unlimited app integrations, brand protection, risk management, dedicated representative. Is Hootsuite Right for You? Due to the steep learning curve and higher price for adding more team members, Hootsuite might not be the one for many people. You are certainly welcome to try the service, but don’t make any long-term commitments. And obviously, start with the free plan first. 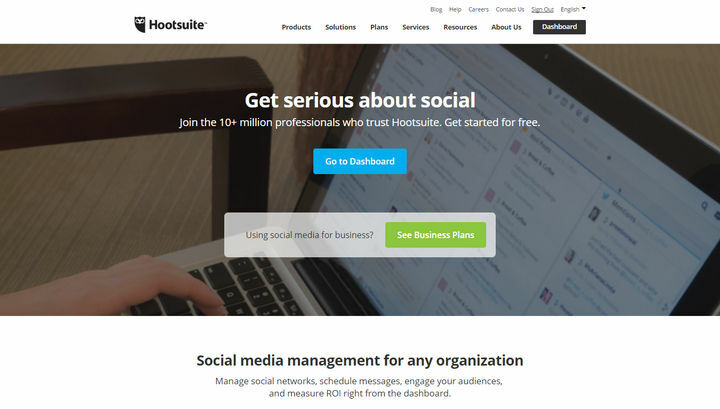 Some reliable alternatives to Hootsuite include Buffer, Sprout Social, AgoraPulse etc. Hootsuite is the perfect choice for medium to large companies which need to run massive social media campaigns. The powerful options and intuitive streams will enable you monitor the social media activities of your brand from one place, which is a huge relief for most business.